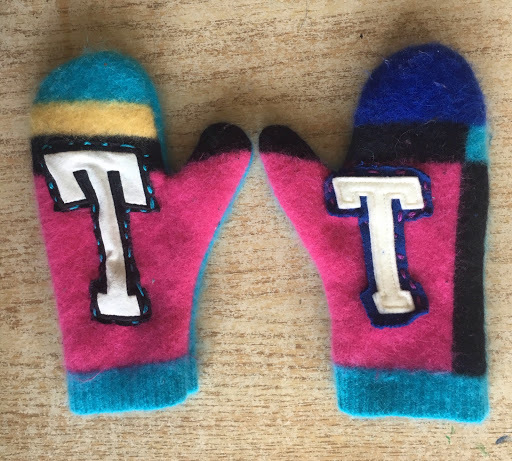 Our mittens were a fantastic success for EVERYONE! First we washed the sweaters in hot water and dried the sweaters to shrink them ( thank you to the parents who donated sweaters! Especially to the parents who went to a thrift store and bought sweaters for us to use :). We laughed a lot at the shrunken sweaters - but I forgot to photograph them! Then we each traced a mitten pattern pattern and cut out 4 paper patterns. We learned that you have to cut accurately or the mittens would not fit you later! We each chose a sweater that we wanted to use. Some people chose 2 sweaters so the front and back would be different colours. 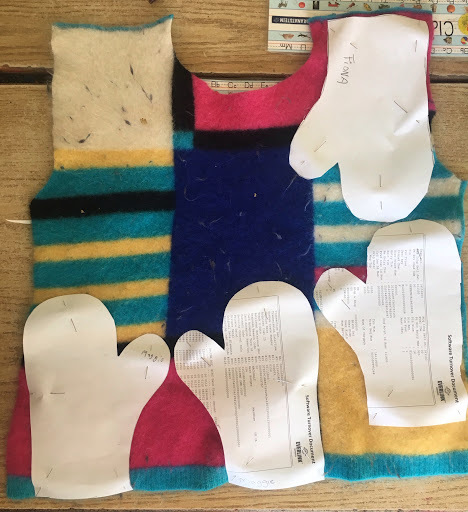 Ms. Brown pinned the mitten patterns to the sweaters to make sure that the patterns went on the proper way. 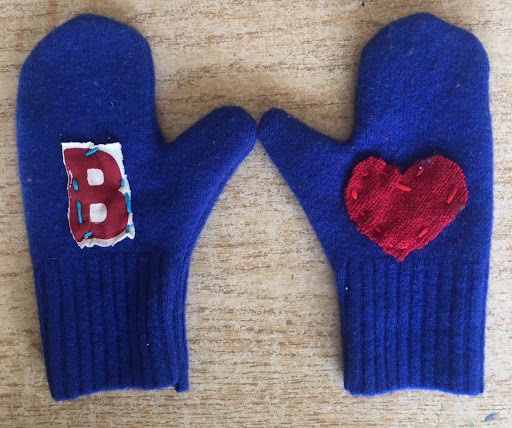 The mittens need to stretch going across the hands, not up and down the hand! 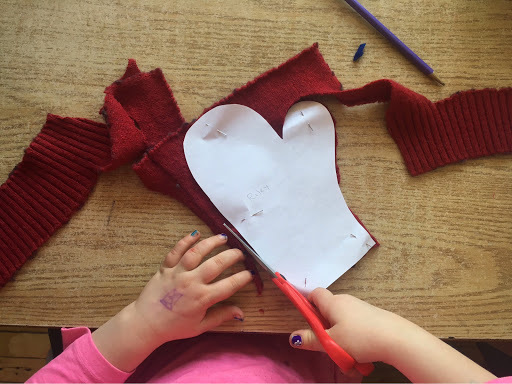 Next, each student cut out their own mittens, using small adult sewing scissors. No-one made mistakes cutting! Only a few students got pricked by the pins. It only hurts for a second, but it's still a bit of a shock. "Ouch! The pin bit me!". 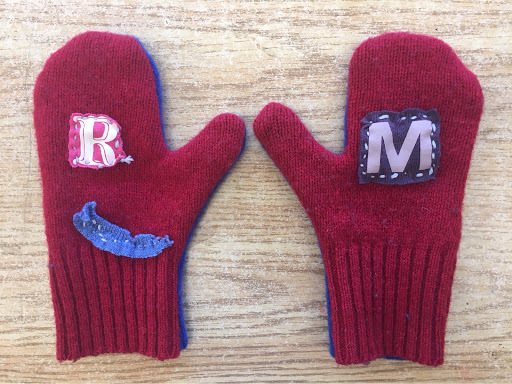 For the next step, we chose letters to sew on the mittens ( these came from a place called Arts Junktion. Arts Junktion is a TDSB - run depot for receiving and distributing donated materials and supplies. These letters were from samples of Roots t shirts) . 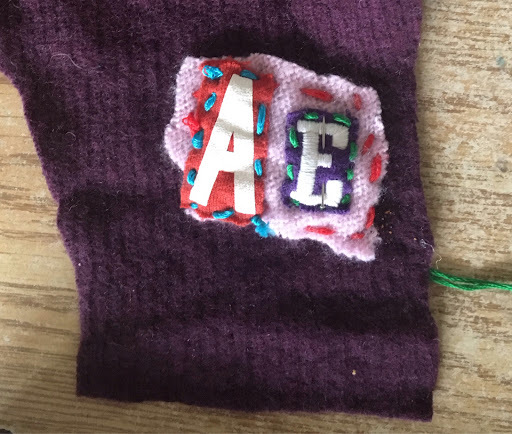 If we didn't have the letter you wanted, or if you didn't want letters, you could cut a decoration from sweater scraps, then sew it on. Ms.Brown helped to thread the needles, but all of the hand sewing was done by the students. Ms. Brown helped to tie the knots of the thread as well. 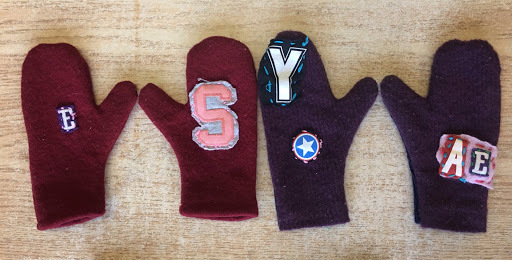 Then we sewed the mitten backs backs to the fronts. We had to stitch them inside out. We looked at our own clothes to see how the stitches are on the insides of our clothes. 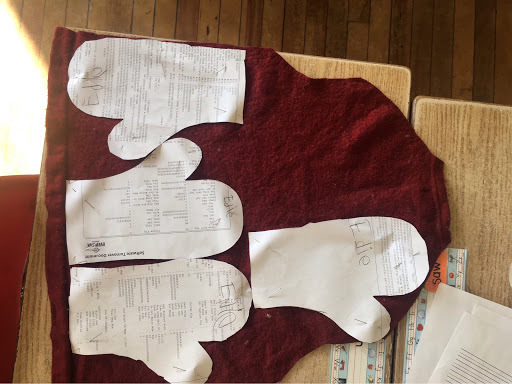 So someone stitched our clothes inside out, and then flipped them Right side out to sell them! 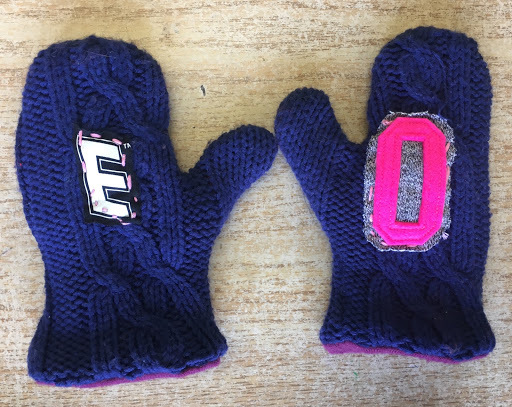 We hope that everyone's hands were warm during March Break!